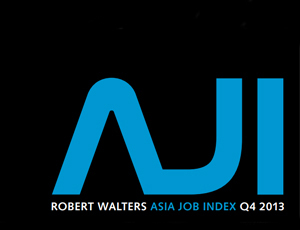 The Robert Walters Asia Job Index reported a significant increase in job advertisements for professional positions last quarter. One of the world’s largest professional recruitment consultancies, Robert Walters publishes its Job Index quarterly to provide employers with a barometer of business confidence and the demand for skilled candidates across Asia. The Index is produced by tracking the number of job advertisements posted daily in key newspapers and on leading online job boards based in Hong Kong, Japan, Malaysia, Singapore, South Korea and China. HANOI – The Vietnamese government has recently released a new Circular on the procedures a foreign worker must adhere to in order to be considered for a work permit. Circular 03/2014 tightens the regulations for foreign workers seeking to come to Vietnam. The Circular will take effect on March 10, 2014 and is intended to help guide the implementation of the proposed Government Decree 102/2013. HONG KONG – From February 5, officials and diplomats from the Philippines visiting Hong Kong will not be able to enjoy the 14 day visa-free exemption they currently do, Hong Kong Chief Executive Leung Chun-ying told a press conference yesterday. The move is in response by Hong Kong to a tragedy in Manila over three years ago, when eight Hong Kong tourists were killed and seven others injured in a hostage situation that lasted over 10 hours. The Philippines’ President Benigno Aquino III has consistently refused to make an official apology for what he sees as the actions of a lone gunman, leading to tension between Hong Kong and the Philippines. In August 2010, after senior police inspector Rolando Mendoza had been dismissed from the Manila Police District, he boarded a tourist bus armed with an assault rifle, in an attempt to get reinstated. The rescue attempt lasted over an hour, and ended after Mendoza was shot and killed. Hong Kong has alleged that it was the poor handling of the incident by the Philippines’ officials that led to the victims’ deaths. The Hong Kong government placed a black travel advisory warning (the highest warning level) on the Philippines, cautioning Hong Kong residents that the country posed a “severe threat” and advising that all travel be avoided. 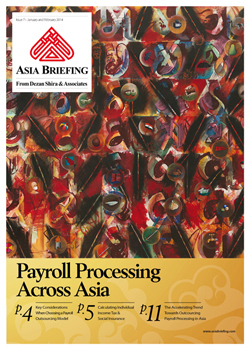 DALIAN – The new issue of Asia Briefing Magazine, title Payroll Processing Across Asia, is out now and will be temporarily available as a complimentary PDF download on the Asia Briefing Bookstore throughout the months of January and February. Collecting tax revenue and administering social insurance are two of the most fundamental roles of government. When establishing or operating a business in Asia, companies must take special care to comply with regulations concerning taxes deducted at the source of employee payroll (withholding tax) and mandatory contributions to social insurance programs. As you might expect in a region comprising so much diversity and complexity, the systems utilized by governments in places like China and Vietnam (countries with large populations and with a communist background) are substantially different than those in places like Hong Kong and Singapore – small jurisdictions with a distinctly capitalist outlook. India, a populous emerging nation with a democratic system of government, provides an interesting contrast in terms of how it taxes and supports its citizens. 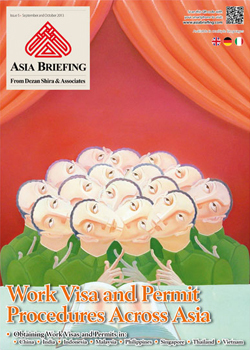 Sept. 12 – The new issue of Asia Briefing Magazine, titled Work Visa and Permit Procedures Across Asia, is out now and will be temporarily available as a complimentary PDF download on the Asia Briefing Bookstore throughout the months of September and October.